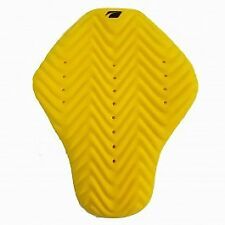 Moto Central: RST Contour Plus Back Protector. Alongside protecting the spine there is now considerable evidence showing that wearing a certified back protector can significantly reduce trauma in a major accident as they reduce the effect of impacts on the ribs and lessen the blows to internal organs too. The Scarab back protector harness is a one size fits all, fully adjustable back harness. RRP £81.49. Ideal for sports such as Motorsport/ Motorcycle racing/ Motocross, Equestrian, Skiing, Snowboarding, Mountain biking/Downhill Etc. 5 Piece Soft CE Approved Armour Set. Clothing > Armour & Protection. Designed and developed by British bikers, the Black™ Motorcycle Clothing & Accessory range is exclusively available at GhostBikes. Brand X Body Armour Jacket. Size Medium Adult. Condition is hardly Used great condition as per photo. Back protector with lumbar joint, plates in polypropylene with corrugated perforated structure. Liner in double jersey. Composite protectors：back, chest, upper arms-shoulders, jointed elbow-upper arm protector. OB100 - Oxford RB-Pi Back Protector Insert. Oxford RB-Pi Back Protector Insert (OB100). Clothing > Armour & Protection. Founded in 1973, Oxford Products are the UK's market leaders in motorcycle security & touring products and export to over 50 countries worldwide. The impactor is a rounded triangular faced prism, of length of 160mm, base 50mm, height 30.8mm and radius 12.5mm. Soft CE Approved Back Armour Insert. Clothing > Armour & Protection. Designed and developed by British bikers, the Black™ Motorcycle Clothing & Accessory range is exclusively available at GhostBikes. D3O Viper 2 Back Insert (For Icon Jackets - But fits many other makes). The D3O® Viper 2 back protector is CE certified to Level 2 Standards. Width = 27cm at widest point. Height = 41cm at tallest point. Here for sale is my Dainese back protector, new and unused. It looks fantastic in Black with the red Dainese logo. (RRP £139.95. Back protector with lumbar joint. 2-layer shockproof PE polyethylene pad, protect your spinal column and waist, easy to use. ). Comprising of Viper Back Protector set of Shoulder armour & set of Elbow armour. WIDTH AT WIDEST POINT: 27cm. EN1621-2 LEVEL 1. HEIGHT : 44cm. 007 Forcefield Pro Back Insert. Instantly improve the safety of your jacket by either swapping out the low grade standard fit insert, or simply place this in the pocket already stitched into the jacket. 43cm x 25cm (at widest part) - used in my Daniese Sandstorm jacket size 38. Excellent condition. Forcefield 002 CE level 1 super light weight back armour insert. Condition is Used. Dispatched with Royal Mail 2nd Class Recorded. 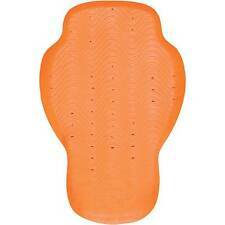 7983 - Furygan Motorcycle D3O Central Back Protector. Furygan Motorcycle D3O Central Back Protector. Show all Furygan products. D3O impact protection. D3O Impact Protection. Clothing > Armour & Protection. Genuine BMW Motorrad Back Protector. Condition is used but overall good. Labelled as Ruckenprotektor 2. Size is Large. I’m 6’2” tall and it fits me comfortably under my jacket. Fully adjustable, super light and comfy back protector - you won’t know it’s there when you are riding. 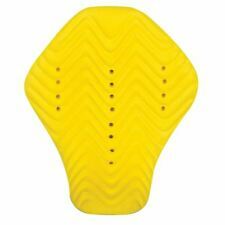 The hard protection is in 5 sections so completely shapes to the contour of your back and coxis/tail bone. Great air circulation so it doesn’t get too hot. I’ve always worn over a thin under-layer so never next to my skin. It hasn’t been sweated in as I’ve not done summer track days or anything like that. Sold bike so selling my gear. Any questions just ask. Dainese 'Core' jacket with built-in non-removable back protector and elbow pads. Forcefield Pro L2 back protector. Size Large. New. Snowboarding. Motor Bike Ski, mountain bike. This body armour is very well made and has no tags. Only taken out the box and packaging for photos. Fully CE approved to Level 2. LITTLE USE. Super Low Profile. Adjustable shoulders and waist belt. Repeat Performance Technology (RPT). Forcefield body armour is the official authorised upgrade armour for Draggin Jeans in the UK. Forcefield Knee Armour. This knee armour is designed specifically for Draggin Jeans and can be fixed to the inside of the jeans using the velcro strip attached to the armour. Alpinestars Back Protector Size Large. Condition is Used. Dispatched with Royal Mail 2nd Class. Fully adjustable flexible back protector. Bought used but never used. 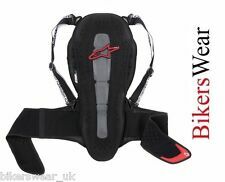 Here i have for sale a b=square motorbike back protector size large in good used condition.